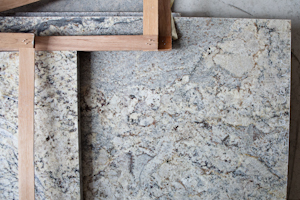 Confused by Granite Fabrication Terms? In the Austin granite biz, the people that transform granite slabs into granite countertops are called fabricators. The fabricator may be just one person, but it is usually the term for the whole company – the group of people that work together to turn granite slabs into kitchen or bathroom counters. So, the company that makes counters is the granite fabricator, but the guy that applies the edge profile is also called the fabricator, not to be confised with the cutter, or the polisher. So the fabricator (edge-profile cutting guy) works for the fabricator (the granite fabrication company) who fabricates the granite slabs into granite counters. When we send orders out to fab that means we’ve sent a diagram out to the granite shop floor. The diagram will be used by the cutter to mark and cut the slab. 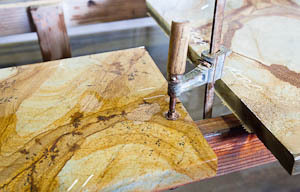 After the cutter cuts the squares, rectangles, kitchen islands and whatnot, he sends it to the next station in the shop – to the fabricator – the guy that actually cuts the shape of the edge of the granite, i.e. the granite edge profile. The fabricator then does the initial shaping of the profile of the granite edge. If the counter will get a bullnose edge, he uses the tool that puts that edge on the counter. When the fabricator is done with the initial shaping of the edge, he sends it to the last station in the shop – to the polisher. The polisher then smooths and polishes the edges of the counter until they are uniformly smooth and even and ready to be installed.